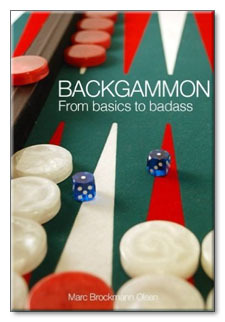 My book, Backgammonfrom basics to badass, is now out. I hope you will like it. It is especially recommendable for beginners or players with little knowledge of theory, but I think there is stuff that might be interesting for the experienced players as well. "Though the information in this book is valuable, this is not a book for beginners in any way shape or form. Yes, it describes how to play and includes opening moves/responses, but then goes on to very advanced gameplay; only someone with years of experience could usefully comprehend. What is the game all about? Concept no. 21: when should you run from and anchor? Concept no. 28: prime or blits? COVER: Backgammonfrom basics to badass is the cutting edge, modern backgammon book, which teaches you all the basic concepts and principles in the game. It beates the older backgammon theory books by a mile. It is very easy to read even for beginners. The purpose of the book is to connect the basic theory with the advanced theory. All earlier backgammon books tend to fucus on just one of these categories. Since publication in Denmark early 2013, this book is now owned by roughly half of the members of the Danish Backgammon Federation, the worlds largest backgammon federation. AUTHOR: I am a former professional soccer player, having played in the Danish Superliga and 1st Division. In 2010 I began studying economics (Master of Economics) at the University of Copenhagen, and since then soccer has been a part-time occupation. In backgammon achievements, I just won my first "Grad Slam," the Nordic Open 2014, in my hometown of Copenhagen. The final match is on youtube, with the outsanding live commentary of the legend "Falafel." In the moment of writing this book I am rated #1 in the Danish ranking system. Additionally I have been on the national team for the annual Denmark vs. The World matches, held at each Nordic Open, since its origin in 2010. Back in 2008/2009, I published the book "World Series Vol 1basic checker play," which was kind of a nerdy book and sold in only 100 copies, which was decent since it was written in Danish and the target group was very narrow. My "performance rating" is among the best in my country. My strongest PR achievement was when I managed to play an average of 2.7 over eight speedgammon matches at the Danish Speed Championship 2012. My average PR in longer matches is probably somewhere between 3.5 and 4.0 (perhaps a little bit better which I get in shape for big tournaments). I am, and always will be, a student of the game. I always try to improved, even though I don't spend as much time studying the game as I used to.